We're proud to be the East Coast U.S. distributor of Sommer Cable America Inc., a wholly owned subsidiary of SOMMER CABLE Germany. 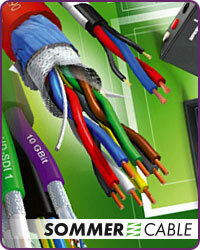 Founded in 1999, Sommer Cable provides a wide range of innovative and high quality cable, connector, stage, PA, hardware and Audio/Video installation and distribution products including their exclusive HICON Connectors. If there is a Sommer Cable product you need that you don't see here in our store, just send us an e-mail or call us at (888) 999-4283 and we'll get it for you!